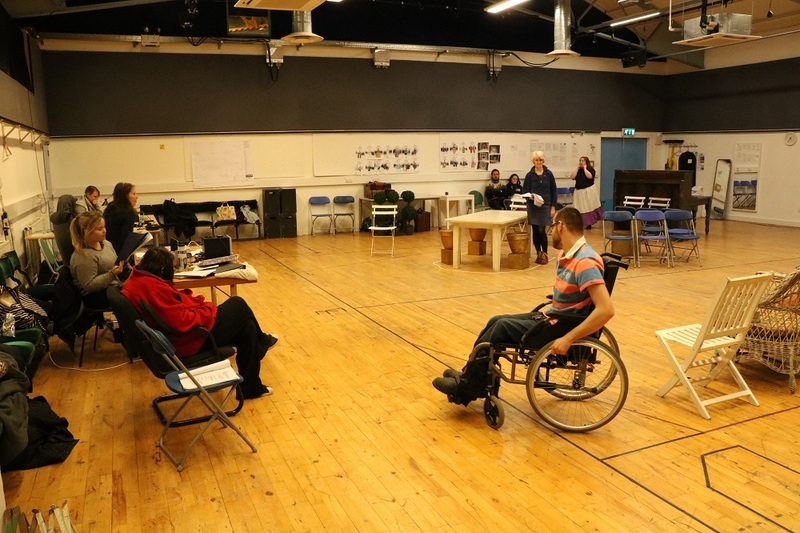 Three Sisters' Assistant Director Fiona Mackinnon shares an insight into the rehearsals! We are just over halfway through rehearsals. Which feels mad to say as the time has flown by! So here is a half time update on Three Sisters rehearsals so far. I was nervous on my first evening session with Lung Ha, because of how close I knew the company were. They are one of only a few ensemble companies in Scotland, training throughout the year, with some of the actors being there for 10 to 20 years. To shake off nerves, I decided to throw myself into the initial company warm-up and any apprehension about me joining - from myself, and the performers -was soon shed. A lot of dancing was had, and the closeness of the actors was really highlighted during some improvisation exercises around themes from the play. I left feeling welcomed and excited! A good start to my Lung Ha journey. Once rehearsals started, we initially explored the story. Chekhov is complex and multi-layered, and so the first challenge was understand the narrative and characters. Chekhov writes more than one main part (a rare gift in theatre), which means there are love triangles, rivalries and many subplots to explore. We did this through character sheets, a giant storyboard that stays on the wall as a reference point, and many discussions along with scene work. We even had a day with just the three sisters, improvising around their relationship. This has led to a beautiful relationship between the three actors (Emma Clark, Emma McCaffrey and Nicola Tuxworth) that is authentic, trusting, and is clearly reflected in their scenes together. Although this is a classic text, it’s really enjoyable observing the actors find ownership, and their own interpretations of the characters. Russian theatre director Konstanin Stanislavski directed the original Three Sisters with the Moscow Art Theatre, in the 1900’s. Although it became regular in their repertoire, Chekhov was unhappy with the original direction as he felt it was too “exuberant” to show the subtleties of the text. Maria Oller (Lung Ha’s Artistic Director) emphasised from the start that she wanted the acting to be as natural as possible. So once we had explored what was happening in the scene, and what intentions were, we looked at stripping back, and being in the moment. This has been an interesting challenge as the company have previously come from doing Moliere and a fun, interactive show at the Zoo, which both call for a very different style of acting. But the naturalism is paying off - the most heart breaking moments come from a character’s acceptance in their fate, or a moment of vulnerability on stage, and as we progress more moments like that are appearing. It would be hard to talk about the first half of rehearsals without mentioning the giant RFO elephant in the room. A few weeks in, we got the heart-breaking news that Creative Scotland had decided to cut Lung Ha’s regular three year funding. This was a hard hit to the company, but Michael, Maria, the Lung Ha support team and actors did an incredible job at rallying support, fighting their cause while simultaneously continuing on with rehearsals. I have never been more inspired than watching their response to that situation. That really showed me the heart, strength and hard work that goes behind Lung Ha - everyone goes above and beyond what their role entails. I was surprised at how much the news affected me - in such a short space of time, how invested I had become in the company, and how lucky I felt to be working there. Fortunately, I wasn’t the only one who felt this way, and thousands of people rallied behind their cause, ultimately leading to a turn around in Creative Scotland’s decision. I didn’t realise there had been a fog in the rehearsal room, until it was lifted the day we found out the funding had been reinstated. We have a new drive and energy moving forward. We’ve got the story, the style of acting and blocking (where people move on stage) down. The next step is the most exciting one - bringing the world alive. This includes working on our transitions, being in the moment in the scenes, and adding the live music! Next week we have the musicians flying over from Finland who will be adding their original compositions to the production, and I cannot wait!